It is known that every tattoo has a story behind it, but most of them are inked based on the personal opinions. 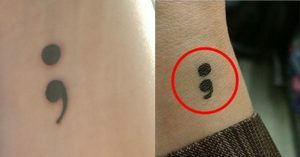 But this Semicolon tattoo has an inspiring story that universally inspires everyone. Though the sign looks simple, the real intention behind the tattoo is, it depicts the strength and survival just like its grammatical meaning which denotes the end of sentence partly, then resumes. This activity of inking Semicolon turned out into a movement in 2013, advising all the abused and survived people to mark the sign on their body. It stands for all those who suffer from anxiety, depression, suicidal thoughts, self-harm, and other mental health problems. This simple act of inking gained its worldwide recognition because of its notable sentimental value. “A semicolon is used when an author could’ve chosen to end their sentence but chose not to. The author is you and the sentence is your life”. When a fellow from Delhi is asked about his story behind the Semicolon on an unusual spot, his middle finger, he said that he has the habit of harming his fingers with blades and he admitted that it was very difficult to overcome that depression and trauma. The idea of inking on the middle finger prevented him from further self-harming he added. Similarly, Shristi, who has semicolon inked just behind her ear says that it is to raise awareness that her autistic brother us just as normal as everyone else. She says that her brother finds it rather tough to be a part of any social gathering. And the social gatherings don’t make it easier either. The tattoo is a tribute to her brother’s struggles but it also acts as a conversation starter. Meanwhile, there are certain personal questions people will face after getting the Semicolon Tattoo for men since it is a popular movement now. At the beginning of the movement, people used to ink Semicolon with a pen, later the movement drew its pace and survivors preferred to have a permanent one.